From the the big non-responce I got here from my last couple of posts on the Traveling Chicken, I thought I'd better do a few normal posts, so everyone doesn't think I've completely Flown the Coop! Jerry brought me a bunch of large sunflowers earlier in the week. They are very cool and really pretty but they are awfully droopy! 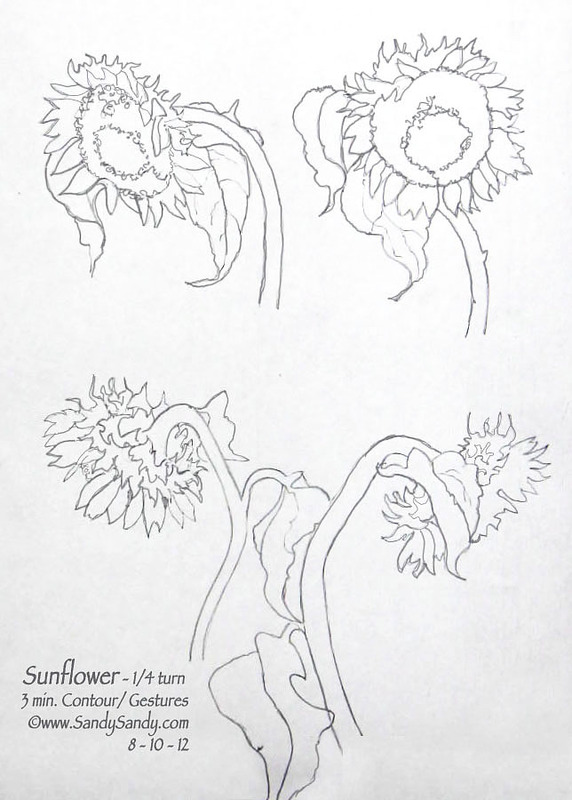 It was hard to sketch them with their leaves all wilting and their heads hanging so limply, bent down real low. I put a couple of big "A" clamps on one as a stand and set it up high above my eye level to get this angle. 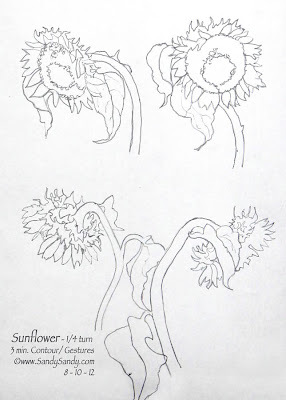 I love sunflowers.......neat angle you've drawn these from. You going to paint them next? Hey Susan! Yes, I probably will give some sunflowers a try in color. Hello Sandy, I really like the sunflower drawing. The viewing angle you chose as looking at it from above eye level or higher is really nice. The petal shapes are interesting too. I can tell that if it was used in a more detailed drawing it would have some neat negative spaces around it. Thanks for sharing! So good to get your comment here Mitch! I hope you are enjoying your summer and finding a little time to create. I hope you are doing well. Thanks so much for reaching out! I like these alot and you have depicted the wonderful heaviness of the flower heads perfectly! I am noticing the sunflowers too and they are calling me to paint- good inspiration here. I am flattered that you found some inspiration here Mary. Thanks so much for your thoughts!